A perfect and authentic looking two columned fixed width wordpress theme, the speedway is created on a shaded orange background. This theme is has a color scheme of grey, white and orange. The speedway has a distinctive large grey header with a graphical design of the earth and the with glassy effects. The theme has a border margin of grey and white colors to distinguish it distinctly from the orange base. 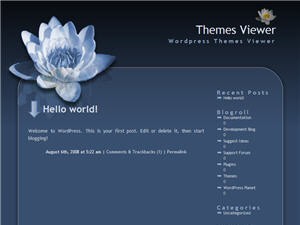 The border has rounded edges and is distinguished into a large content area and a prominent side bar. The content area of the theme has a dark grey base for the proper display of the articles, posts and comments posted on the blog. The sidebar of the theme also has a dark grey background with orange colored sidebar titles and fonts which contrast with the background. The margins of the sidebar and the edges of the sidebar titles are also soft edged giving it a more authentic look. The speedway wordpress theme was designed by web hosting Rally.